Born: November 28, 1915 in Visalia, California. Graduated UC, Berkeley, B.A. French (year unknown - but during the depression). Taught high school in Sierraville, CA and Los Molinas, CA before coming to Red Bluff. Met husband, Edward Mathew Liebersbach at dance in Los Molinas in 1943-1944 (?). They were married June 21, 1944 in Chico, CA. Alma and Edward bought and operated a 160 acre dairy ranch just northeast of Red Bluff on the south bank of the Sacramento River (with 1-2 miles of river frontage) just upriver of and across from Ide Adobe. While living on the ranch they had two childern, Dave-1946 and Barbabra-1948. 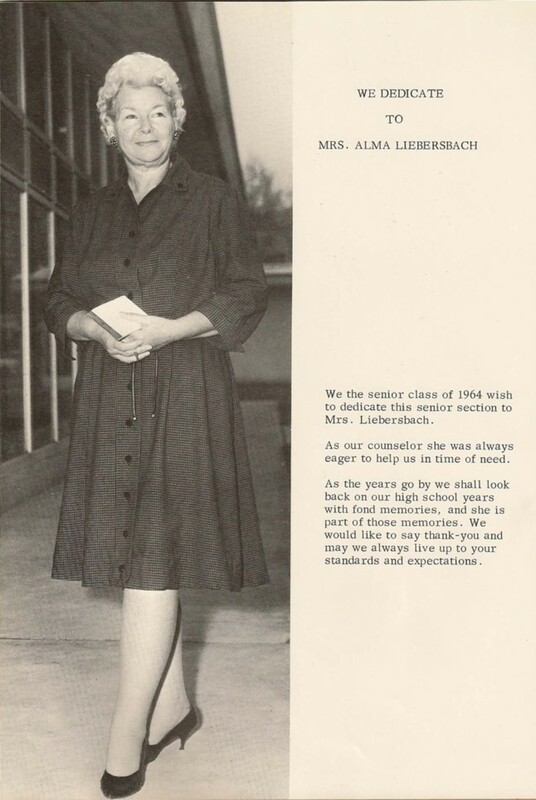 During this time Alma was a stay-at-home mom/ranch hand. In August 1951 Edward was killed in a farm accident during a harvesting operation on a farm/ranch about 5-8 miles south of Los Molinas. Facing a large mortgage and no way of operating the ranch by herself, Alma sold the ranch moved her family into Red Bluff-rented a large house on Main Street about half way between the Chicken Shack and Growney Moters. She went back to teaching high School-RBUHS. Alma's father died of TB five months later and her mother (known by all of the family as 'Grandma') became part of the family for the next 25 years helping to raise Barb and Dave.